Only by comparing the scene today  the smaller photo, above  is it possible to fully appreciate the tremendous changes which have taken place at Eastwood. Known as Cockden, the area boasted a chapel, dyeworks, pub called The Halfway House and, of course, a railway station which was the collection point for all the mills between Callis and Woodhouse. 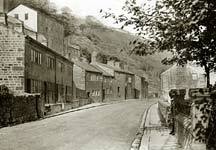 There were also several cottages and, further down the road and not pictured, Eastwood Council School. The large photo dates from 1895 and shows what was obviously a bustling little community with an identity all its own. Now not a single building pictured exists; Eastwood Congregational Chapel was demolished in the 1960s, only the graveyard and the railings remain to mark the spot.